The AAPD is currently in the midst of a Crosswalk Ordinance Enforcement Campaign. Overall, I'm pretty happy with the ordinance. I think it's good to yield the right of way to pedestrians who are waiting to cross at marked crosswalks. And after a year or so of enforcement of the law, I see more motor vehicles yielding to pedestrians. That said, there are still some spots where I routinely see cars fail to yield to pedestrians, notably the stretch of Huron between Fletcher and State. Unfortunately, this is not one of the targeted crosswalks on the AAPD's enforcement campaign. By biggest criticism of the ordinance, is more of an issue with how the city communicates with its citizens in this post-newspaper age. How do we get the word out about our new ordinance to all the folks that live here, and to the numerous folks who commute here for work everyday? How do you get the word to out of town visitors? 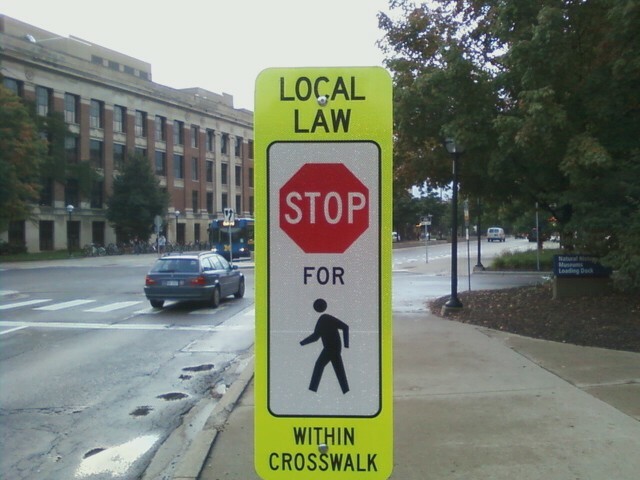 Also, these signs (like the one in your picture) say nothing about stopping for someone waiting at a crosswalk. I think the ordinance is great, but as the prior commenter alluded, the signs could be more clear about what is expected of vehicles. There are a few places where the roadside signs are accompanied by signage over the streets - these are easer for me to notice as a driver, and more likely to result in me checking for pedestrians looking to cross the street (rather than already in it). I don't think many drivers are aware that they can get a ticket for failing to yield to peds...perhaps the enforcement campaign is just what the doctor ordered. Book 'em, Dan-O! The ordinance endangers life. Since the dawn of primative travel - Roman chariot, wagon, automobile, jock rocket - roads were always the domain of faster-than-pedestrian traffic. Walkers found the roadside and in some towns the sidewalk to be their friend. While an authoritarian government can make any law and enforce it, the logical rules of the road (aka responsibilities)are cars the street walkers the sidewalk. The transition from one to the other is on the encroacher. To warp that logic is possible by mass obedience. Not likely to work in the United States - not even in DamnArbor.